The right of self-determination for all peoples was first enshrined in the Charter of the United Nations. It has however been the subject of extensive debate and controversy. Both the content of the right as well as who can assert it continue to evolve in international law. According to the International Covenant on Civil and Political Rights (the ICCPR), ‘[a]ll peoples have the right of self-determination. By virtue of that right they freely determine their political status and freely pursue their economic, social and cultural development. '[i] The right to self-determination also has its economic content which gives the peoples the right to freely ‘dispose of their natural wealth and resources without prejudice to any obligations arising out of international economic cooperation, based upon the principle of mutual benefit, and international law. '[ii] The phrase ‘all peoples’ – instead of ‘everyone’- attached to the right to self-determination indicates that the right to self-determination is a collective right; that is, only a ‘people’, not an individual, can exercise the right. Initially conceived, the right to self-determination belonged to the population, or people, of a fixed territorial entity, specifically peoples oppressed by a colonial power. The Declaration on the Granting of Independence to Colonial Countries and Peoples and the jurisprudence of the International Court of Justice emphasise the connection between the right to self-determination and peoples of colonised territories. In this context, the right to self-determination is “externally” exercised by secession from a colonial power to form a new state. The right of colonial peoples to external self-determination is well established in international law. The International Covenant on Civil and Political Rights, opened for signature December 16, 1966, Art. 1 (1), 999 UNTS 171. See, for instance, General Recommendation No. 21, Committee on the Elimination of Racial Discrimination, para. 4, 23/08/1996. Jose R. Martinez Cobo, Study of the Problem of Discrimination Against Indigenous Populations, Sub-Commission on the Prevention of Discrimination and the Protection of Minorities, UN Doc. E/CN.4/Sub.2/1986/7/Add.4 (1986). 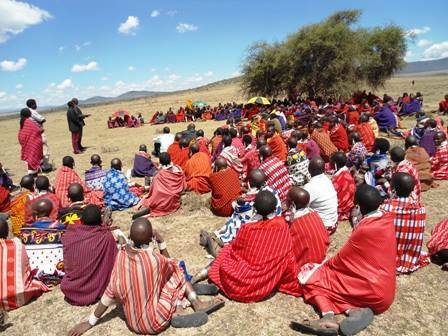 Photo: Maasai in Tanzania. Credit: Minority Rights Group.